← Column prep…part the first. Making a *tapered* column plumb on a curvy Victorian house that wasn’t necessarily built square/plumb in the first place is a challenge…but column # 1 was installed on Friday. I also cut column # 2 to length and embarked on its “prime dry prime dry prime dry attach endcaps” regimen. The ordeal of putting multiple coats of primer on Column # 2 was made more interesting as all the neighborhood cats came to visit…and some insisted in helping. Slinging paint at cylinder with a couple cats doing figure eights around your ankles while others sit by offering helpful advice or encouragement can be fun! I can’t wait till it’s time to stain the back deck. A few hours of priming, painting, and installing endcaps later I got the second column installed. I also did a bunch of trim work, puttying of nail-holes, lots of caulking, etc in the area. Everything still needs a finish coat of paint, but I’ve also got SO MUCH more trim to put up against the soffit…much of which is…of course…a strange size (4-1/2″ for the initial trim). I’ve got to get some 1×6 and rip it down for that. There is SO much missing trim to do that I expect I’ll give everything a finish coat of paint first…as the primer isn’t supposed to be left uncoated for more than a couple weeks…and then maybe hit the major stuff first and circle back around to the trim and fine details. I imagine weather will interfere here shortly as well. 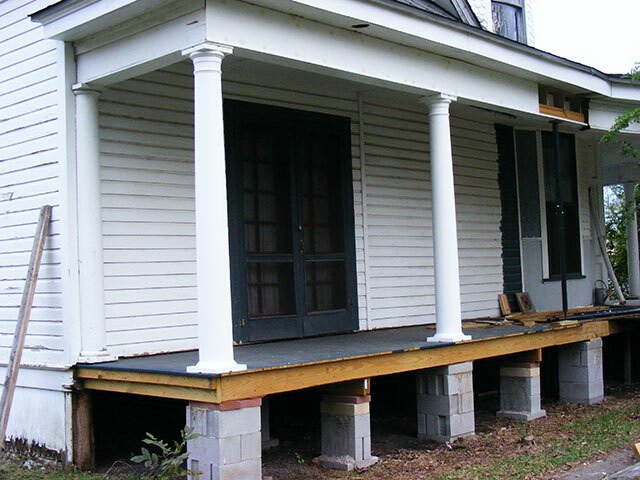 Not sure if I’ll start the underpinning or move on to the next section of porch next (more structural work there). I have SOME materials for each direction…but not enough for either…so it’s a harder decision than it should be. 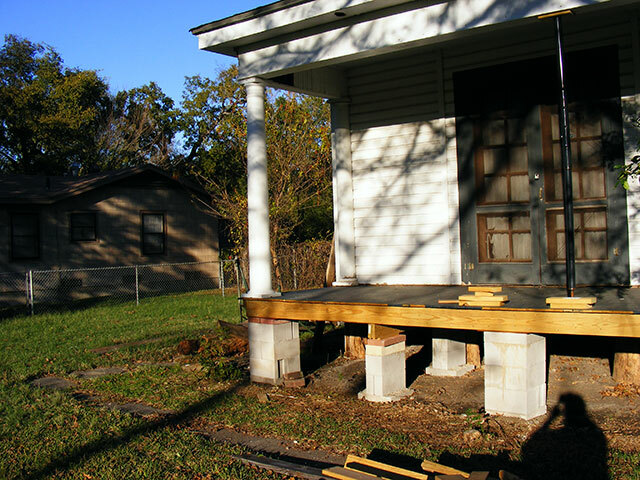 And of course…once I get the underpinning on…I’ll be right back where I started at the beginning of the year…needing to install railings.